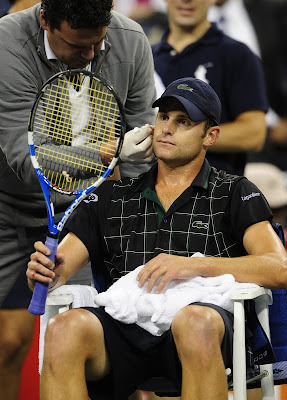 Donald Young lost to Robredo, Dokic just lost, Roddick’s ear is a danger to ballboys, Schuettler lost in five, Dev Varman won, Davy cruised, Fed beat some WC and Hewitt had no idea who he was playing. Is Maria Kirilenko back? Stosur struggled, Vogele won, Mayr got toned by Radwanska the Greater, Clijsters and Schiavone barely warmed up, Bartoli toasted some poor girl, Rybarikova got a win, Gallovits managed four more games against Pennetta than she got in her last first round defeat, Kanepi was woeful, the Brito shrieker went through, Bepa looked cool – she’ll play a somewhat revitalised Chaky next, Venus was woeful but still won, Serena is the fav remember – not Venus. Who is this Vesnina girl and when did she start winning? Dani took three sets as usual and Olaru lost.